We are Awash in Apples! And Here are Two Perfect Pictures Books to Celebrate Them! As the growing season comes to a close on the farm, I am in awe of nature. Living close to the land and the immediacy of its rhythms and seasons, it certainly gives one a new respect for how we find and feed a nation and a world. We are awash in apples right now. Macoun, Honey Crisp, Gala, Fuji, Golden and Red Delicious, Dandee Red and Granny Smith have been harvested, first, in woven baskets plunked up and down the rows, and later, tumbled and topped off, into larger bins. Each time I bite into one, either unadorned, slathered with peanut butter, or baked into Gram’s apple cake recipe, I am reminded of the real life folk hero, John Chapman, affectionately known as Johnny Appleseed. “Who Was Johnny Appleseed?” by Joan Holub from the entertaining, educational and enriching “Who Was..” series has been reviewed at The Snuggery. But there are others that also deserve a read and a listen. First, there is a beautifully poetic version of his life by Reeve Lindbergh, daughter of famed aviator Charles Lindbergh and author, Anne Morrow Lindbergh. Her poem wanders through the seasons of John Chapman’s life from Leominster, Massachusetts to his death in Fort Wayne, Indiana. It is a joyous celebration not only of the seasons of his wanderings and plantings of apple orchards ahead of settlers as they both headed west, but it also echoes the seasons and rhythms of the pioneer life and spirit in its commitment to growth, seen in the plantings and harvest of many springs, summers, falls and winters. A hundred years of snow. Images and words are wonderfully matched and caught in a timeless way in Kathy Jacobsen’s folk art paintings detailing and chronicling in a quiet way, the integrity of this man called John Chapman, who, in perhaps many ways, came to signify other pioneers that planted and harvested right alongside his wanderings. Let your child wander too with Johnny Appleseed this fall and his pioneer families that risked and offered much to us and to each other to fuel our country’s growth. In apple time each year. And the air was crisp and clear. Sometimes to flesh out a figure takes many points of view on the very same subject. For it is in the compilation of the sensibilities of each author’s individual mood and telling, that a truer image of a person emerges for a young reader. While details may overlap in some picture book tellings of Johnny Appleseed, I have found the more the merrier – and the better. For in each picture book tale of this remarkable man, you and your young reader will have a truer, richer, more resonant picture of John Chapman. She concisely organizes her picture book with each page depicting a parchment-like scrolled inset, called “The History,” where she summarizes, in prose, a particular event in Johnny Appleseed’s life. And, at the bottom of the page, she inserts, “The Fact” which gives a clear, concise historically-based note, that gives authenticity to her prose. Jim Burke’s paintings fit the mood and mystery surrounding this young man that some say traveled with a mush pot atop his head, as it doubled both for a head covering and cooking utensil! Young readers will love Jim Burke’s young, impish Johnny, sitting at a table loaded with apples, taking a big, satisfying bite of a crunchy red apple, with a warm and cozy quilt as backdrop. 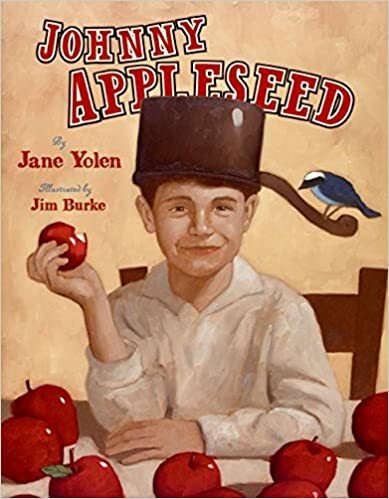 As families wander through apple orchards this fall, it’s the perfect time to introduce young readers to the wanderings and wonder of this young man from Leominster, Massachusetts called Johnny Appleseed. Peel back the pages and take a bite of both!